Sylhet, Dec 22 (Just News): Finance Minister AMA Muhith on Thursday said the directors of The Farmers Bank Ltd have destroyed the bank through looting. "It's the directors who destroyed The Farmers Bank by plundering money but there's no apprehension that the bank will be shut down," he said while talking to reporters after inaugurating the 43rd branch of Bangladesh Development Bank Ltd at Islampur in the city. Asked that the customers are not getting their deposits back from the cash-strapped bank, the Finance Minister said Bangladesh Bank (BB) has been supervising the matter. "They'll take the decision over the matter as well as appointing the administrator," he added. 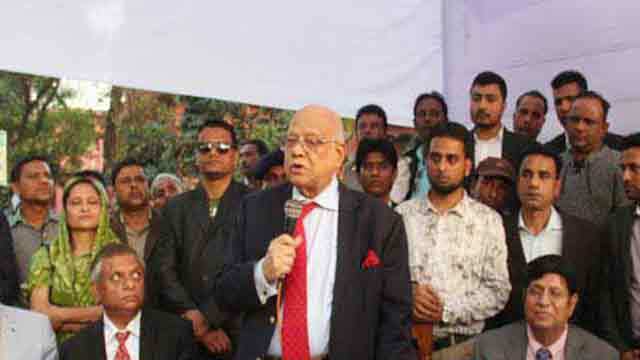 Muhith later inaugurated the Rikabibazar Road in the city. During the inauguration, he said a flyover will be built in Sylhet city aiming to ensure a smooth and hassle-free movement for the dwellers. "The residents of Dhaka and Chittagong are getting the benefit of the flyovers as traffic jam has been reduced remarkably in the two major cities," Muhith said. It will save time while the country's economy will get a boost once the traffic congestion comes to a tolerable level, he added.